KATHMANDU, Nov 9: The most important day of Tihar, the festival of lights, is being marked today by offering tika by sisters to their brothers. 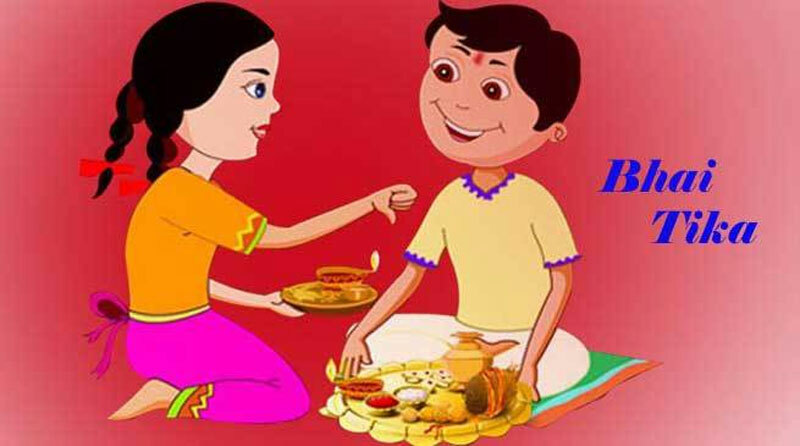 Sisters throughout the country offer 'tika' to their brothers wishing them happiness, long life and prosperity on the occasion of Bhaitika. On this day, brothers are seated at a specially anointed place around which a trail of mustard oil is drawn. The sisters then offer the brothers tika and garlands of 'Dubo' and 'Makhamali'. After placing colourful tika on the foreheads of their brothers, sisters offer them a treat consisting varieties of sweets, walnut, spices and 'Sel', a special kind of bread cooked in oil. The occasion commemorates a legendary event in which a sister has won a boon from "Yama", the deity of death that her brother would not die until the mustard oil is dried up and the garland of 'Dubo' and 'Makhamali' faded.